As you can see this master cyl is smaller than the disc brake master cyls. 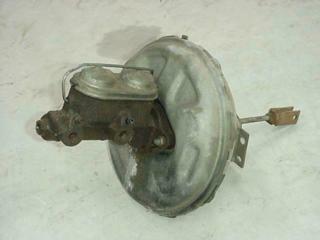 It has residual pressure valves in the outlet holes and will not work properly for disc brake use. Note the L88 adjustable proportioning valve below it. This master cyl is taller than the proper master cyl for a first gen Camaro.It has extra reservoir capacity for four wheel disc use and is recomended for racing. Common on pickups. 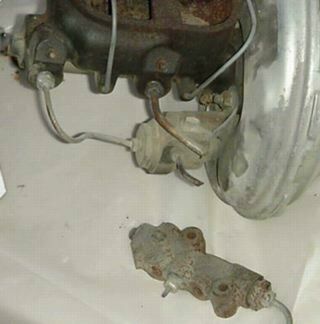 Must be a pre 1970 type because it has a separate metering or hold back valve attached. These were used on second gen Camaros but will work on firstgen too. 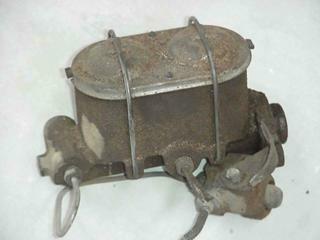 This is a 69 disc brake master cylinder and booster. 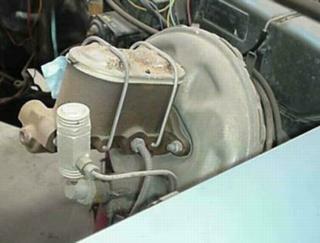 The brake metering or "hold back" valve is attached. It's hard to see, but there is a rubber boot on the right hand side that you have to press to allow brake bleeder pressure to go to the front calipers for bleeding. Below this would mount the brake warning switch. The proportioning valve would be mounted on the side of the frame rail below the driver seat. The valve below is called a combination valve. 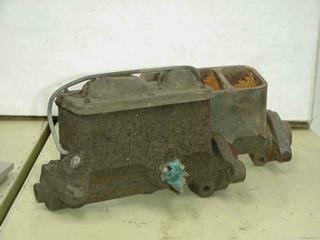 It is found on 1970 and later GM cars. It does three jobs, metering, proportioning, and brake light switch. It has a rubber tip on the left end for bleeding, similar to the valve above. If you are converting to discs, use the combination valve. Master cylinder the front piston is held in position by a small bolt in the front fluid reservoir. The two small holes are the vent, and replenishment ports. Note that the front spring is weaker than the rear spring, this would cause the front piston to bottom out first when bench bleeding. It takes about 20 lbs to even start compressing the rear spring. This might give a slight front bias to the brake line pressures, but not a lot.